Gil, Elaine, Chuck and I camped here back in March of 1998. I was in my nascent 'desert rat' stage back then and somehow came across this locale in my research as a good place in the high desert to check out. When we got to the campground, it was cool, partly cloudy, with some light rain coming down, but altogether a nice, secluded area with plenty of available sites, all with fire rings, tables & shade ramadas. 2) Later that day, when we hiked up to the top of Saddleback Butte, we found a tin can there holding notes from previous hikers. We left our own note there with the admonition to "stop and smell the primroses." 3) When I identified an unusual-looking bird near the campground as a loggerhead shrike to Chuck, he promptly replied that 'loggerhead shrike' would be a great name for a band. Go figure. 4) I heard my first great-horned owl just before falling asleep in the tent that night. The 'hoo hoo hoo' call was unmistakable. 5) On our way back to La Puente the next day, after we parted ways with Elaine & Chuck, Gil & I toured the Antelope Valley Indian Museum http://westernsojourns.blogspot.com/2011/12/antelope-valley-indian-museum.html. We also stopped by Alpine Butte http://westernsojourns.blogspot.com/2011/12/alpine-butte-wildlife-sanctuary-n-los.html which was supposed to be a good wildlife viewing area, and almost got stuck in the soft sand off road. Luckily, I had the brilliant idea to put our tent's ground tarp under the rear tires of our vehicle so that we could back up on to it. It worked, but it was an unpleasant deja vu of the time we got stuck off Kelbaker Rd. en route to Las Vegas. 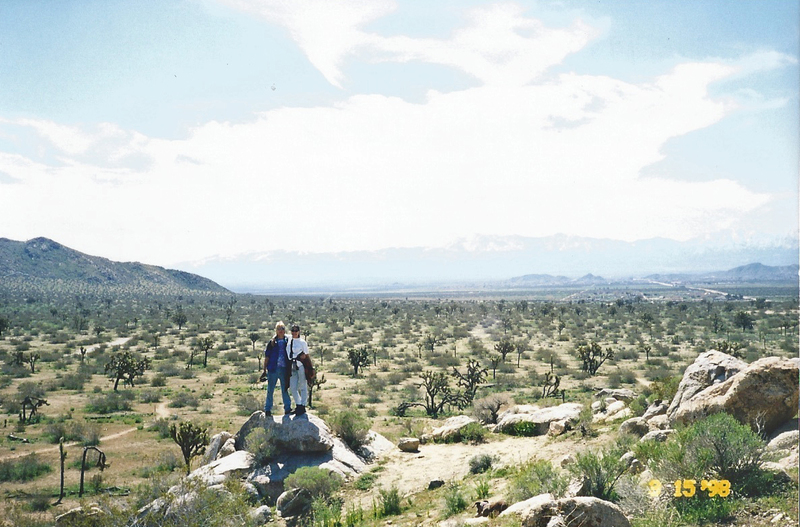 The area is predominantly Joshua Tree woodland & creosote scrub, with the granite butte itself towering over the floor of the Antelope Valley at over 3,600 ft. In decent rain years, wildflowers bloom in abundance here. 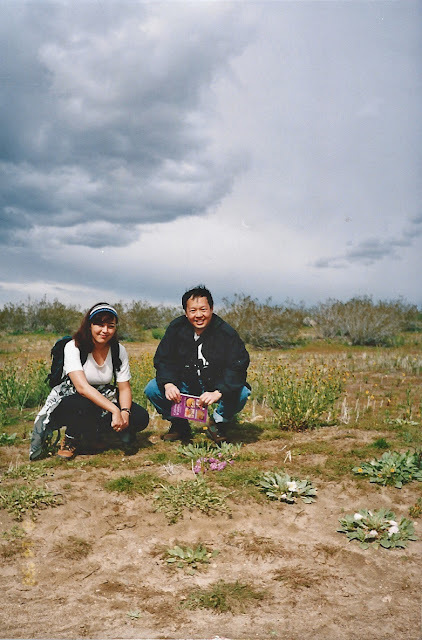 3/14/98 Gil & I, surrounded by Dune Evening Primroses (Oenothera deltoides), Saddleback Butte Trail. 3/14/98 Elaine at the summit of Saddleback Butte. 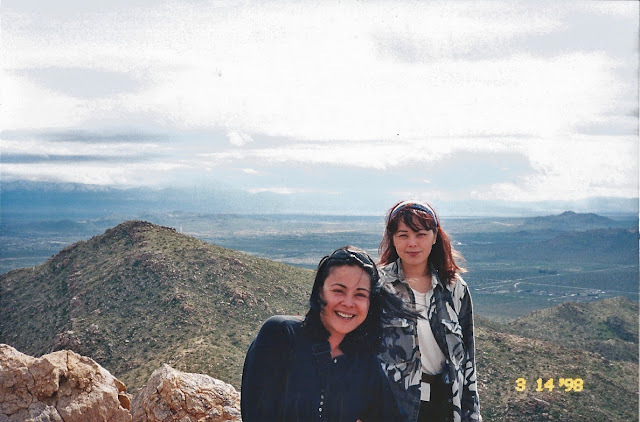 3/14/98 Elaine & me at the summit of Saddleback Butte. 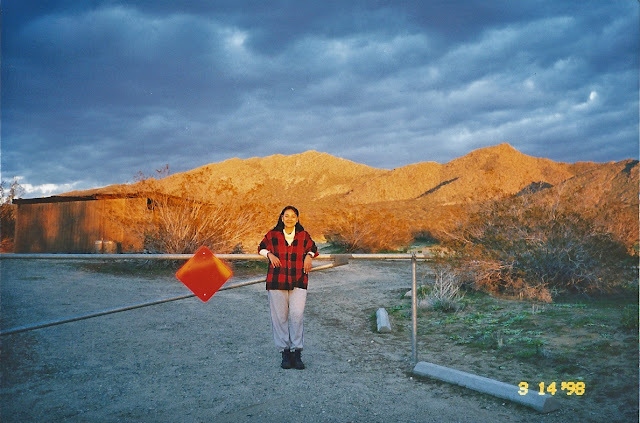 3/14/98 EE, back at the campground after the hike. 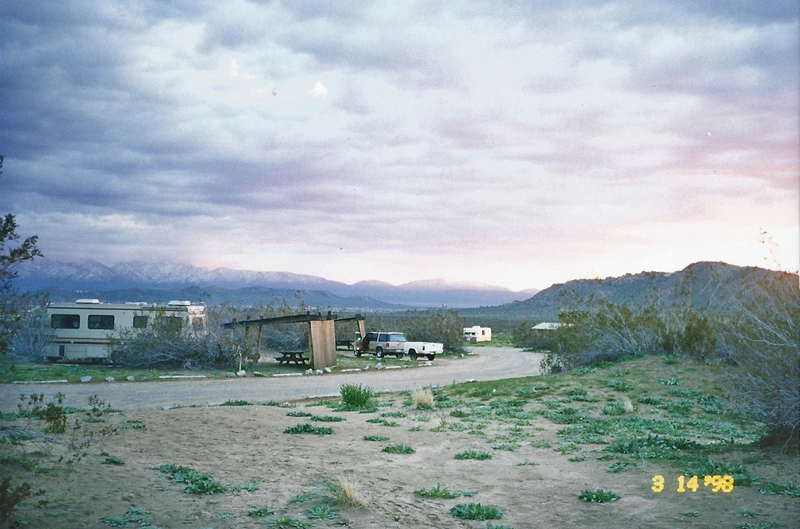 3/14/98 Evening setting in at the campground. 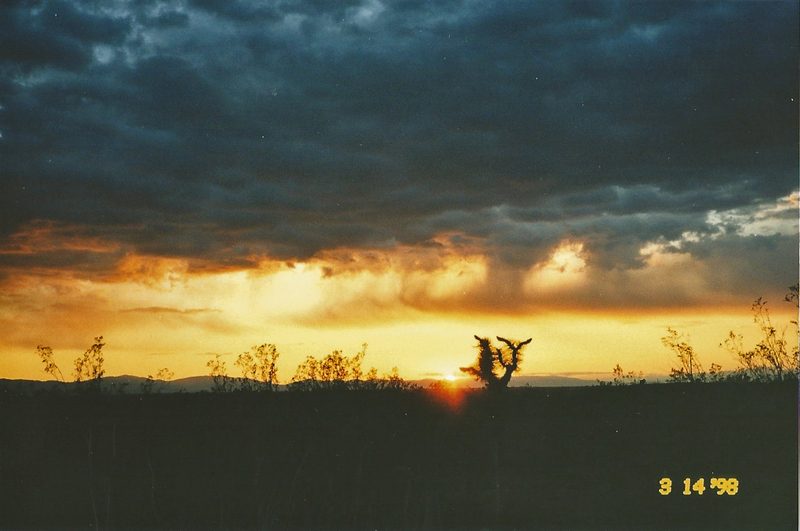 3/14/98 Sunset at the campground. 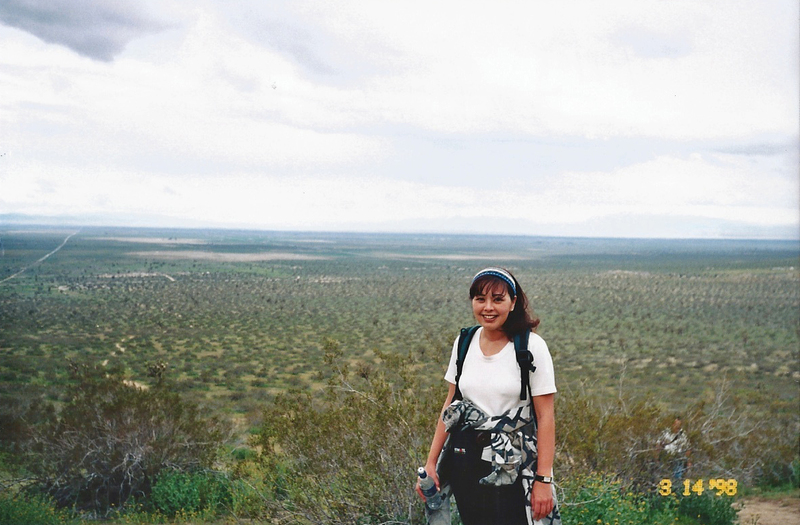 3/15/98 Dowen Nature Trail at the visitor center/ranger station at the Saddleback Butte SP. 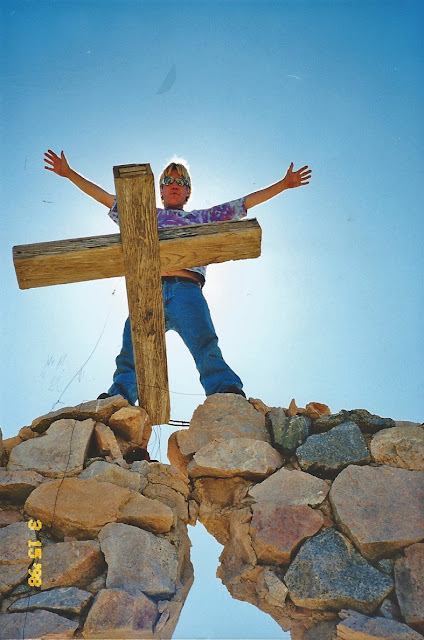 3/15/98 Chuck being Chuck. 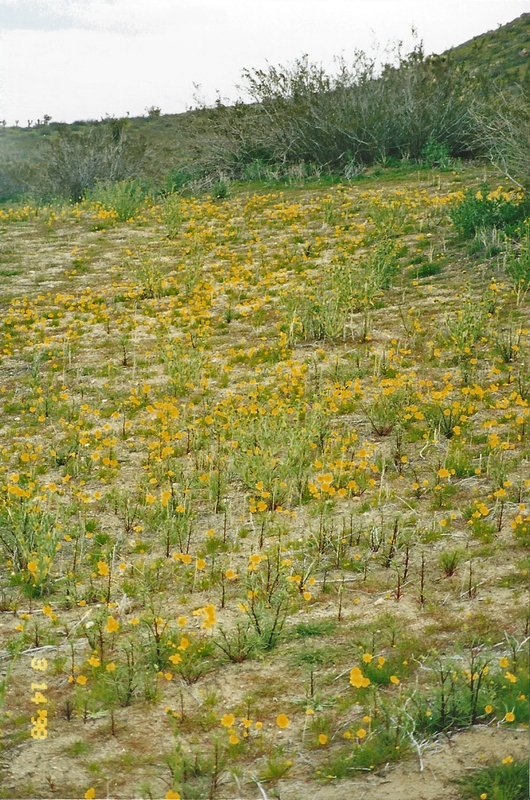 Church ruins near Saddleback Butte SP just north of E. Avenue J & 170th Avenue E.
3/15/98 At church ruins near Saddleback Butte SP just north of E. Avenue J & 170th Avenue E.
3/14/98 Lots of Bigelow's Coreopsis (Coreopsis bigelovii) in bloom along Saddleback Butte Trail. 3/14/98 Desert Rhubarb (Rumex hymenosepalus). 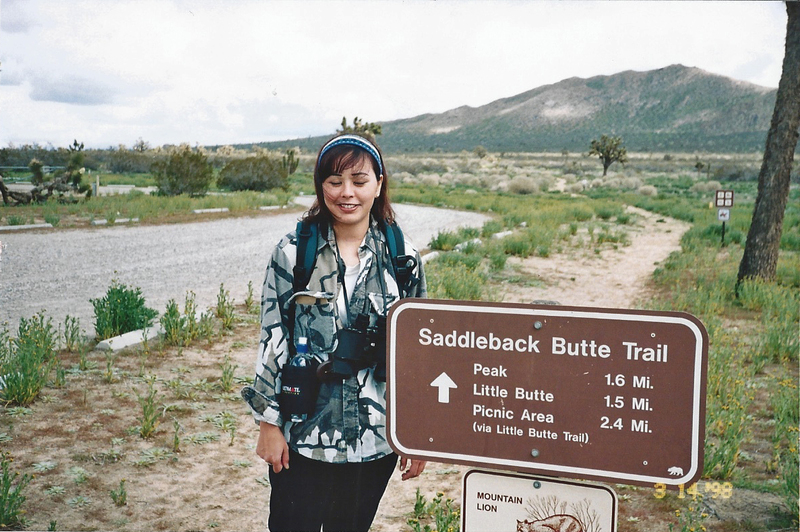 Saddleback Butte Trail. Elevation: Saddleback Butte is 3,651 ft. Directions: From Hwy. 14, exit Avenue K and go east to 170th St. East. Turn left, and the campground entrance will be on the right. Day use area is 1 mile further up at Avenue J. From I-15, take 138W, then turn right on 165th St. East. The road curves around and becomes 170th. Continue on 170th St. to Avenues K & J.
Saddleback Butte Peak Trail is a 2.5-mile trail from the campground to the top of the peak. 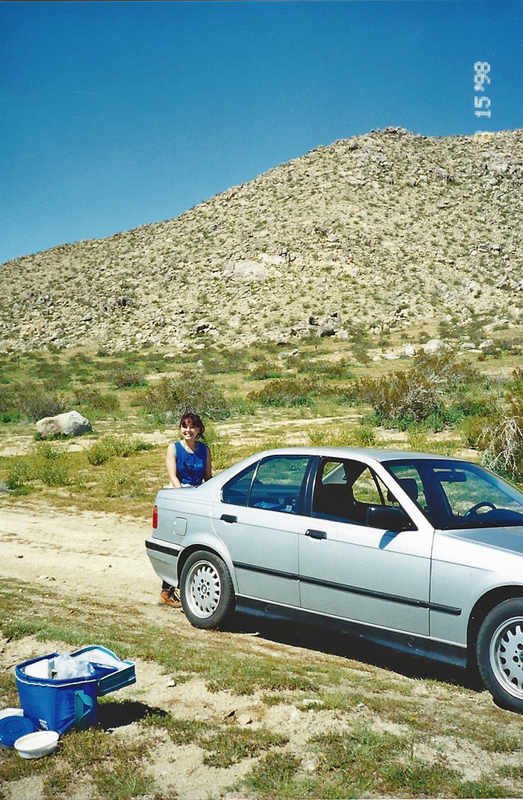 It rises nearly 1,000 feet above the desert floor's 2,700 ft. elevation. It intersects Little Butte Trail, which leads to the day use area (the Little Butte Trail is a 1-miles spur that passes through a large Joshua tree forest). 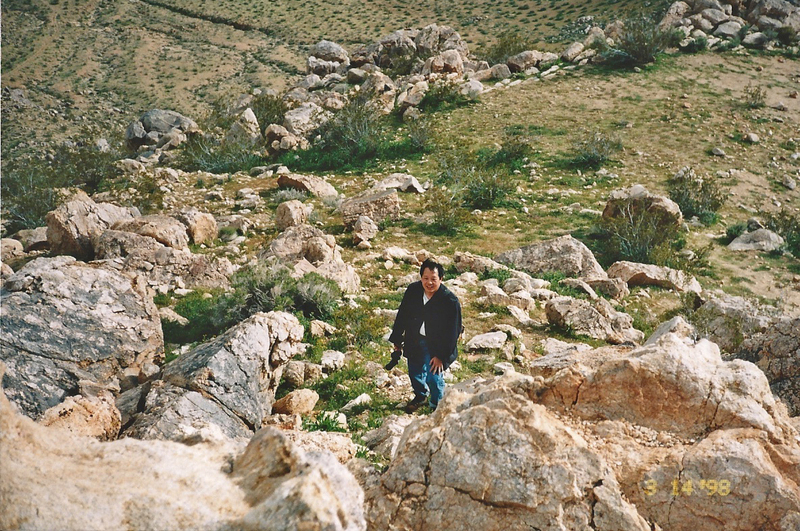 The lower 2/3 mile of the trail is sandy and the climb becomes steeper. The last 1/3 mile is quite steep and very rocky. 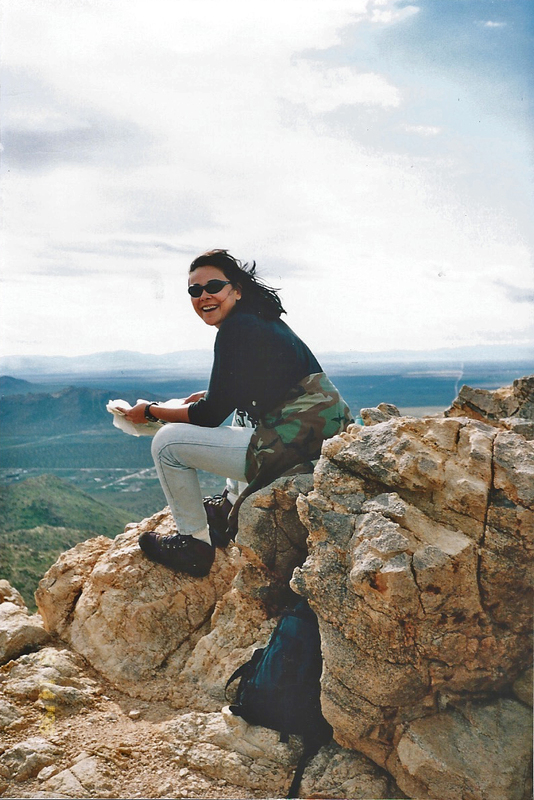 In 1998, we found a tin can at the top of the peak (a Doubletree Hotel canister) holding notes, hiking journals from previous hikers. From the top of the butte, spectacular views of the Antelope Valley and the San Gabriel Mountains to the south. The Dic Dowen Nature Trail is an easy 1/2 mile loop at the visitor center, with self-guiding trail brochure. Equestrian: There is a designated trail and staging area for horses. Check the park website for more info. Amenities: Day use: there are 25 picnic sites (at Ave. J & 170th St.), with tables, char-wood stoves, each with a shade ramada. Pit toilets at the picnic area are near Little Butte. Visitor Center: Located in the day use area. For hours, call (661)727-9899. Camping: 50-unit family campground, first come, first served. Tables, stoves, shade ramadas, potable water spigots, flush toilets & lights in the bathroom (no showers). 30' maximum for RVs/campers. Fees: Day use = $6.00/vehicle. 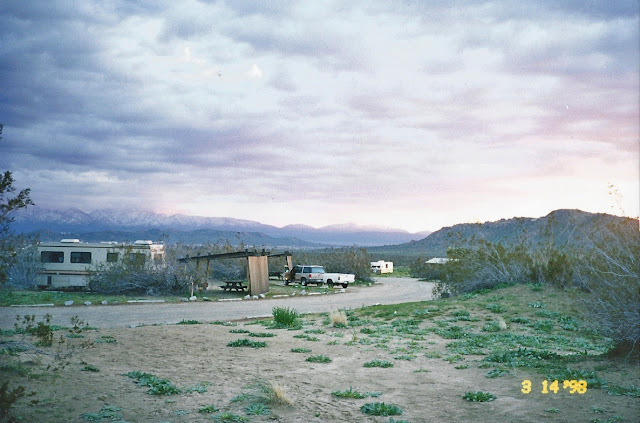 Camping = $20/site per night (includes one vehicle), with $5.00 for each additional vehicle. Self registration at day use area & campground entrance. Hours: Day use: sunrise to sunset. Pets: Must be leashed and kept in tent or vehicle at night. Being a state park, dogs are not allowed on the trails. 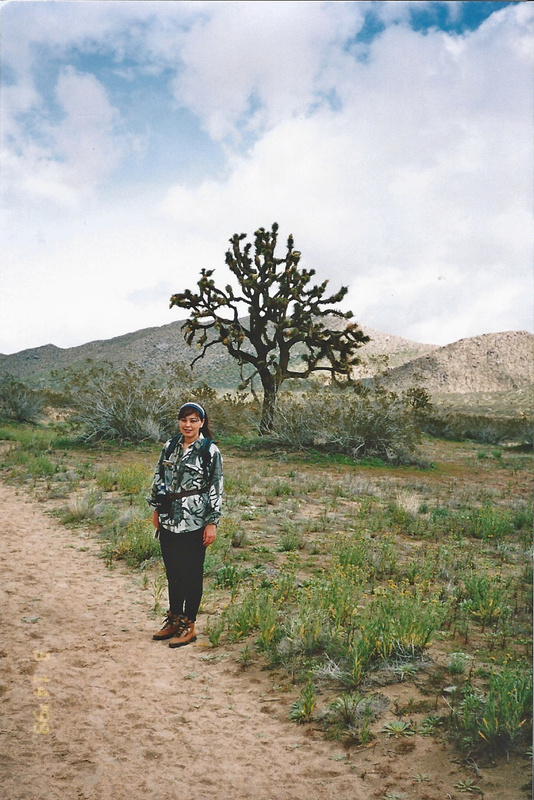 Flora & Fauna: Joshua Tree woodland & creosote. 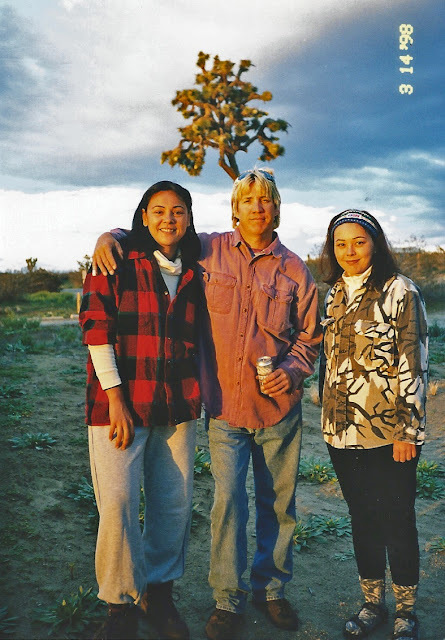 Coyotes, kit foxes, jack rabbits, cottontails, ground squirrels, kangaroo rats, badgers, skunks, sidewinders, Mojave Green rattlesnakes, desert tortoise, and birds such as golden eagles, hawks, owls, horned larks, sparrows & finches can be found here. What we saw: Loggerhead shrike & European sparrows. We heard a great horned owl and many coyotes in the evening. Dune evening primroses (Oenothera deltoides), desert sand verbena (Abronia villosa), bigelow's coreopsis (Coreopsis bigelovii), filaree, buckwheat (Eriogonum spp. ), desert pincushion (Chaenactis spp. ), common fiddleneck (Amsinckia spp. 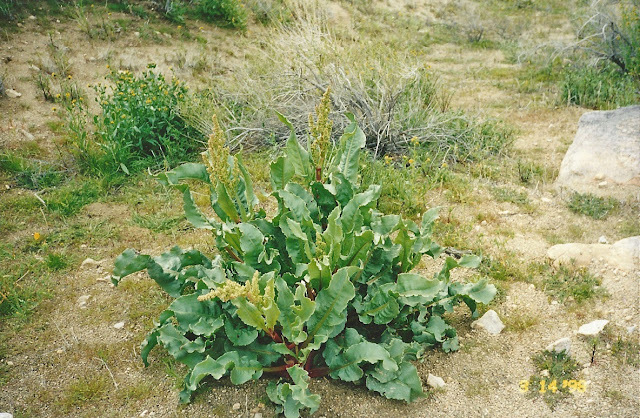 ), desert rhubarb (Rumex hymenosepalus), and Joshua trees (Yucca brevifolia) in bloom. 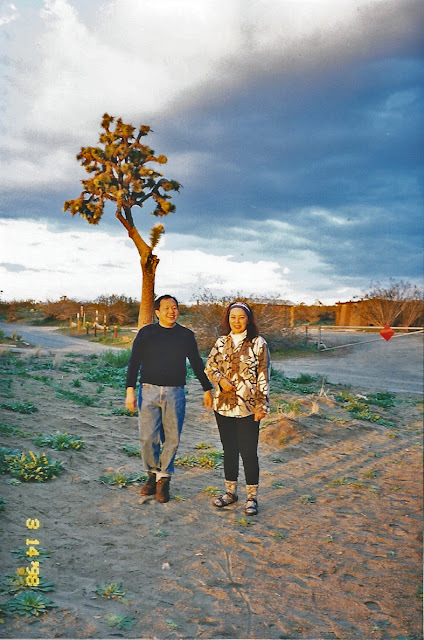 Miscellaneous: The park was created in 1960 to protect the granite butte, disappearing native Joshua tree woodland, and other natural features. 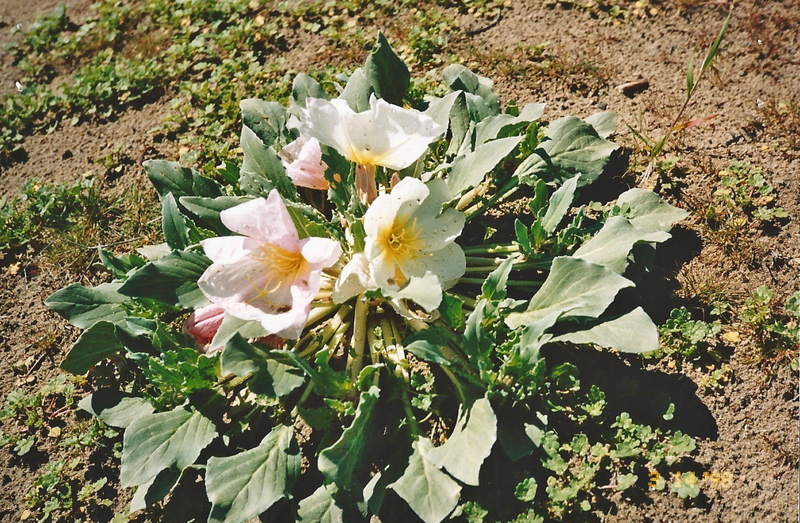 The best time to visit is from February to May for the wildflowers and in October-November, when the weather is pleasant. Summer temps average around 95F, but can get up into triple digits, while the winter average is on the chilly side at 33F.